Ebendo (42.75% WI; Energia, an indigenous company and operator, 55% WI) is located onshore, in the central Niger Delta approximately 100 km north-west of Port Harcourt and covers an area of 65 km² (16,062 acres). The License includes two fields, Ebendo (producing) and the Obodeti field (undeveloped). The field was awarded by the Federal Government of Nigeria during the marginal field allocation round in 2003. This acquisition was made pursuant to a marginal field farm out agreement between NNPC, Elf Petroleum, Energia and Unipetrol Production and Development Company Limited. 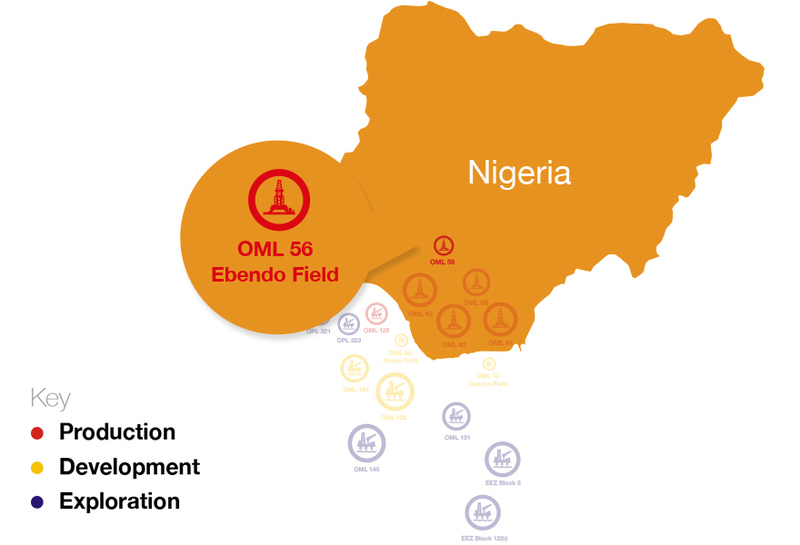 OML 56 contains light sweet crude oil ( typically 50° to 52° API), condensate and natural gas. The Ebendo flowstation(10,000 bbls/day) is connected to a gathering faclilty at Umasadege through a 6 inch diameter, 8.5 km pipeline.